Bruxellisation is a French term coined to describe the destruction of the architectural heritage of Brussels. 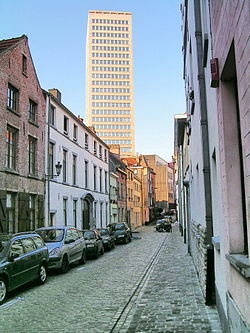 In urban planning, Brusselization (in French bruxellisation and in Dutch verbrusseling) is “the indiscriminate and careless introduction of modern high-rise buildings into gentrified neighbourhoods” and has become a byword for “haphazard urban development and redevelopment” 1). The notion applies to anywhere whose development follows the pattern of the uncontrolled development of Brussels in the 1960s and 1970s, that resulted from a lack of zoning regulations and the city authorities' laissez-faire approach to city planning 2). Montreal has known a similar fate during the years 1960-80 AD, but the process seems to have slowed down lately.